If it's the top quality replacement toner cartridges for the HP LaserJet 2550n laser printer you are shopping for, then the choice is pretty obvious. With us you won't find anything aside from top quality toners that have been built to be compatible in your printer. Not only do you get our cast iron promise for premium laser printer cartridges, but you'll also get next day delivery and for free. Saving cash with Cartridge Save is ridiculously simple because of our complimentary delivery. We consider super quick delivery seriously, resulting in 98% of all orders arriving the following day. You can have satisfaction when you place an order with Cartridge Save courtesy of our company's extensive 12 month refund policy that comes as standard on everything. If you happen to experience any problems using your HP LaserJet 2550n laser toner cartridge within 12 months after purchase you simply have to post it back to us for your 100% reimbursement. Aesthetically superior to many laser printers in the market, the HP Colour LaserJet 2550n boasts an unconventional design, leaving behind the ugly box-type tradition. The machine is the second installment in the 2550 series and boasts built-in networking. The HP Colour LaserJet 2550n also offers top-quality printing and low running costs, thanks to its high-capacity toner cartridges. However, it falls short in terms of print speed, which, at 3.9 ppm (colour) may not be good enough for high-volume requirements. 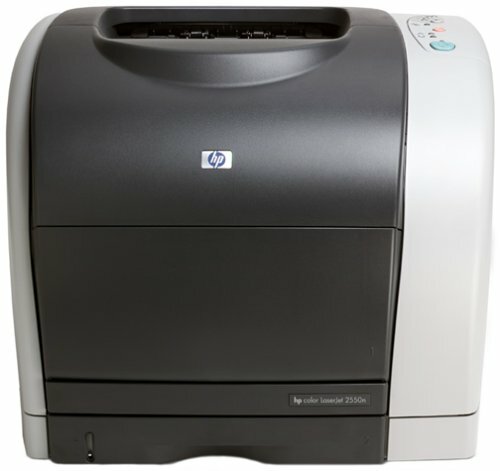 The HP Colour LaserJet 2550n measures approximately 19x17.8x12.8 inches and offers several connectivity options, including wired networking via Ethernet. Standard configurations include USB and parallel connection. It comes with a 125-sheet paper tray that can be expanded to 250 or 500 should the need arise. The HP Colour LaserJet 2550n also features several control buttons for accessing basic functions. The HP Colour LaserJet 2550n is designed for growing work groups, boasting built in networking and offering excellent print quality at minimal costs. The machine keeps text dark and sharp; even the smallest fonts come out clear. However, print speeds are below par at 12 ppm and 3.9 ppm, respectively, for black and colour prints. While it is a reliable device, the HP Colour LaserJet 2550n is certainly not the best choice if speed is important.